Freud was certainly dealing with a big question when he asked, "What do women want?" As a modern man, a husband, and the father of a daughter, I try to support feminism as much as possible. But sometimes the women's movement can be confusing. I'm happy that women are doing admirable things today like running companies and holding public office, but is it chauvinistic of me to be unexcited that women are also doing things like getting tattoos and smoking smelly cigars? The first story I want to talk about involves a women's issue I can support wholeheartedly. 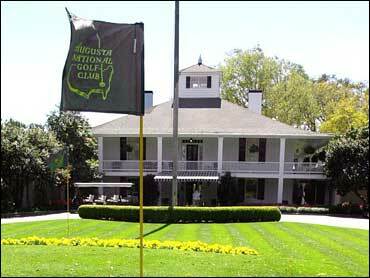 Women are not allowed to be members of the Augusta National Golf Club, home of the annual Masters Tournament. That doesn't seem right to me. Martha Burk, the chairwoman of the National Council of Women's Organizations is fighting this ban. (Her organization, NCWO should not be confused with NOW, the National Organization for Women. See? I told you it can get confusing). Evidently, since the club is private, they can legally ban whomever they want. This may be true, but why would they want to ban women? At a time when golf is trying to change its image from a stodgy, exclusive "old boys" club, this resistance to change isn't helping. Moreover, since Augusta National never admitted a black member until 1990, it's hard to see the exclusivity that they are desperately holding onto as a harmless tradition. I can hear them talking this over in their oak paneled clubhouse with a drink in one hand and the Augusta bylaws in the other: "We already let them vote and go to work. What more do they want? We see them at home. Do we have to see them where we relax, too?" What do the members of this club think would happen if they admitted women? Do they fear the "slippery slope?" Are they afraid that next women will demand to use the men's bathroom or that they'll picket for the right to burp and scratch? Curiously, at the same time that golf isn't exactly welcoming women to their hallowed course, another traditional male activity is attracting more and more females. Women are grabbing their guns and going hunting in record numbers. Should I feel guilty that I don't feel like celebrating this step forward for women? Dr. Christine L. Thomas, a natural resources professor at the University of Wisconsin at Stevens Point, conceived the national movement known as BOW or Becoming an Outdoors Woman in 1991. (Obviously, BOW shouldn't be confused with NCOW or NOW — or with BOW WOW, the sound a hunting dog makes). Twenty thousand women a year pay $200 for a weekend of instruction. Dr. Thomas claims that hunting helps build self-esteem in women. I'm a huge fan of self-esteem in women, but aren't there better ways to achieve it than by shooting animals? Dawn Fairling, a wildlife educator, is very involved with BOW. She has opened the world of hunting to thousands of women in the last 10 years. She is proud that she has gotten many female clay pigeon shooters to become real dove hunters. She even goes to schools to enlist girls into the "mystique of shooting and hunting." Somehow, as opposed to Ms. Fairling, I haven't felt a need for more school kids to get interested in guns. I know, I know. Some of you probably think I'm a hypocrite. After all, how can I be for allowing women to join a traditional male bastion like Augusta, but not be excited about encouraging women to hunt just like their male counterparts? But if I disapprove of men doing something, is it really anti-feminist of me to disapprove of women doing it, too? It's all very confusing. No wonder Freud was stumped, and he didn't even have Oprah or Dr. Phil to help him make sense of things. On second thought, maybe it isn't all that confusing. After all, both groups just want women to be able to shoot birdies.